Alright, that's it. I love My Texas Market! I can't deny it. I should probably just move to Texas. Since I can't, getting a taste of Texas delivered to my door is pretty, pretty awesome. If you live in Texas (or the South, really), you have no idea how jealous I am of all your delicious food. Here in Seattle... Well, if you like kale smoothies or all-natural "chicken," you'll feel right at home. 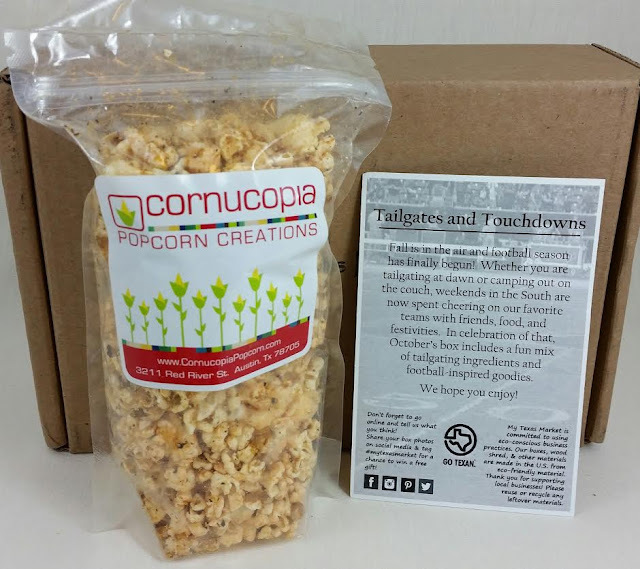 The theme this month is "Tailgates and Touchdowns" and includes products you can serve at your football parties along with some things to get you through the aftermath. While I don't root for Texas teams (Go Hawks!! ), we do get down and dirty on game days. Each box contains an information card telling you about what's included and why. This month, My Texas Market teamed up with the Houston Food Bank and will be donating 10% of the net proceeds from this box to help feed those in need. M.B. Vintage Essentials Beer Soap- This smells amaaaazing!! And nothing like beer, thank goodness, although it does have beer as an ingredient. This is a huge chunk of soap, too. 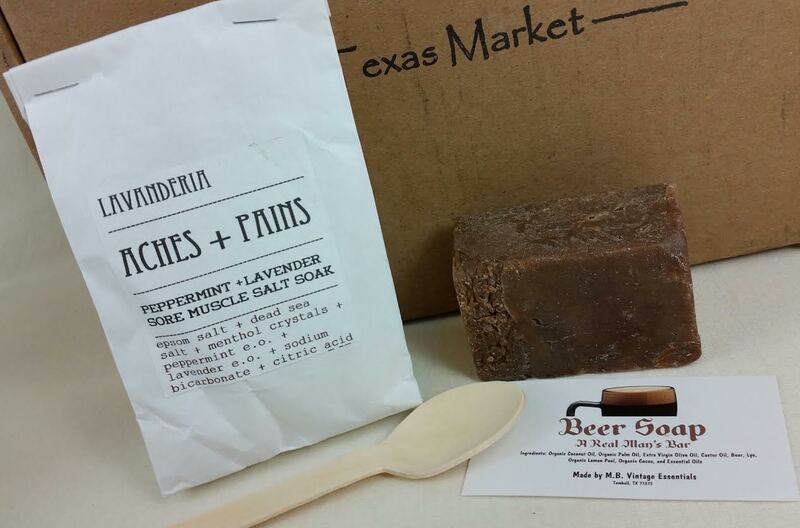 It's made with organic coconut oil, olive oil, organic cocoa and has some lemon peel in it. Seriously, I wish I could eat it. The information card says that they can't include beer so they included the next best thing. I'm pretty sure this *is* the next best thing. I can't even tell you how good it smells. LaLavanderia Pain Salve- Billed as "nature's Icyhot" this is made with camphor, menthol and arnica. Massage it into painful areas. It smells so good I don't even care if I'm in pain or not, I still want to use it. 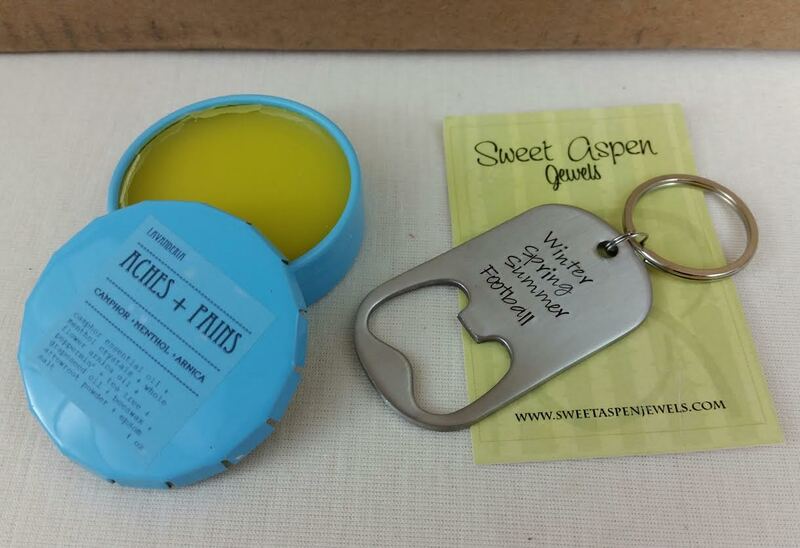 Sweet Aspen Jewels "Football Season" Keychain- This is custom made just for My Texas Market subscribers. While we don't love the Cowboys (or the Texans), we DO love the Seahawks so this bottle opener is pretty perfect. Stellar Gourmet Lavender Candied Jalepenos- At first I wasn't sure what I would do with this but the information card says to pour it over cream cheese and serve with crackers. That is an excellent idea and I'm doing that. I might save it for Thanksgiving. Or I might take it to a Halloween party. Either way, it'll be interesting. I don't want to really waste it on a bunch of guys who are screaming at the TV. Medicine Woman Herbs Healthy Spice Blends Carnivore Grill Rub- Oh, this will definitely get used in my house. It's 100% organic and can be used as a dry rub or marinade. It has garlic, juniper berry, rosemary, marjoram, oregano, black pepper, onion, thyme and bay leaf in it. VERDICT: This box made me smile. My Texas Market is doing such a great job with curation. This box had fun, useful and interesting products and snacks in it. Everything in this box will be put to good use in my home. Aaand since I already ate the bag of popcorn... I need more. Obviously. That's the hard thing about getting good products in boxes like these. You get addicted to things you didn't know you needed in your life! Of course, that's part of the fun, too. 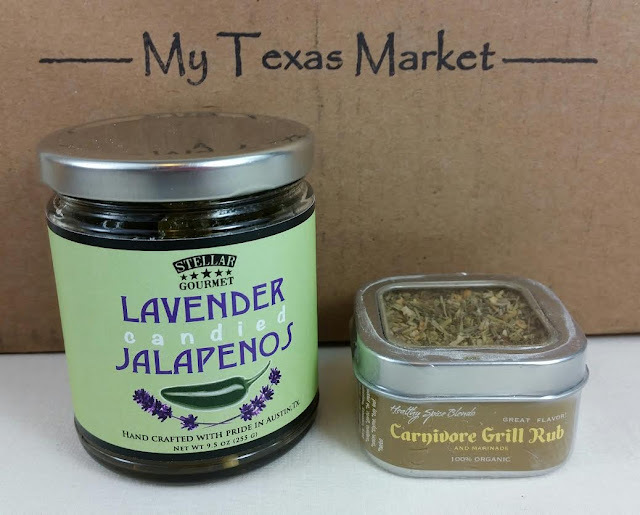 My Texas Market has done a great job of bringing new and interesting Texan companies to my notice and I am loving it. It also has a really good value, too, especially for a specialty box like this. If you would like to sign up for My Texas Market, you can do that here. 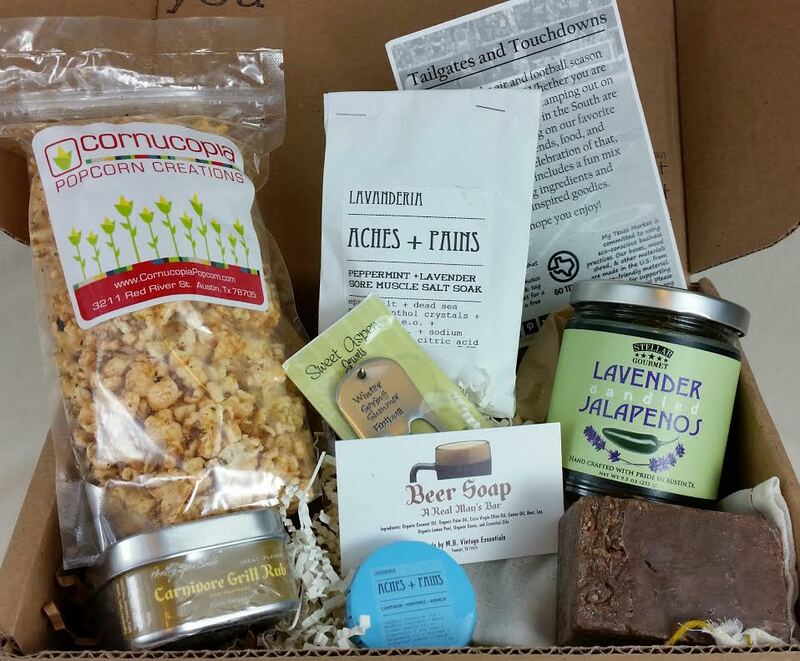 Your subscription will begin with the November "Harvest Season" box while supplies last. 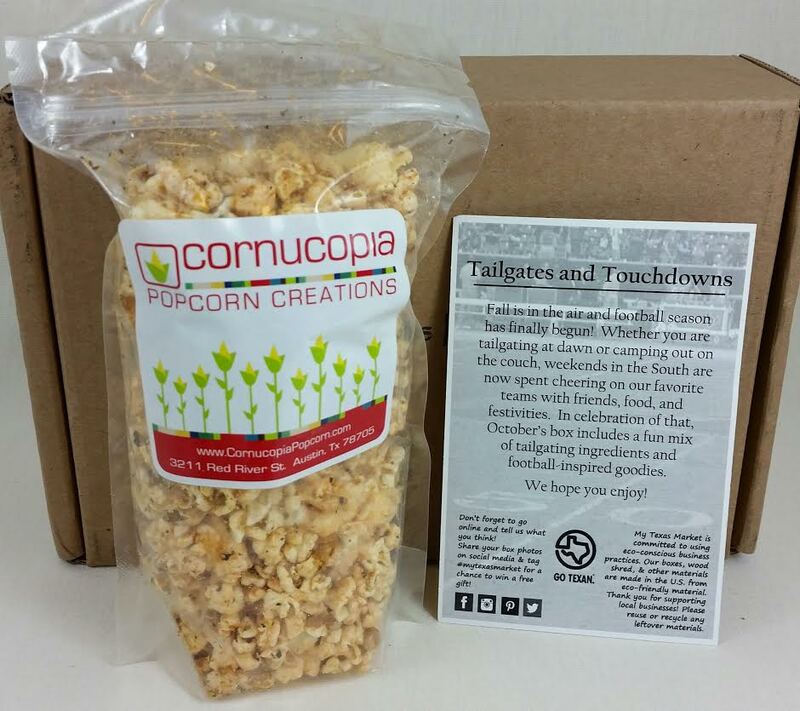 Use code 10FIRST to get 10% off your first box.